Dear viewers. 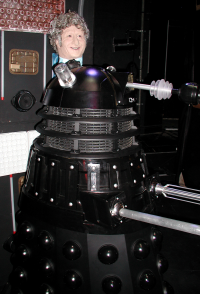 It has been brought to my notice that the podcast below – series one, number seven Escape to Danger/Dalek Special can cause vehicle damage and personal injury. Especially if its being listened to on a motorway slip road. One apparently ends up facing the wrong way. Viewers are advised that we take NO responsibility for any injury or damage to persons or possesions that may happen whilst our podcasts are being listened to. Especially if its the bit about ‘Eddie’s Hoover Accident’…. 38.54 — Keep ’em peeled…. 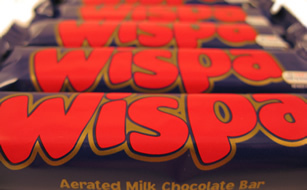 For what may be a short time only, the Cadbury’s Wispa is back! Many people would have heard about Cadbury relenting to the Internet pressure (on the likes of MySpace, Facebook and various Internet petition sites) and agreeing to bring back the ‘Velvety Textured Milk Chocolate’ bar for a limited 23 million run. And I have two! I haven’t dared open one yet. Can I defile the sacred Wispa wrapper? With only about a third of a bar per head of population, do I have the right? Do I risk my immortal soul by even thinking of biting into a Wispa? Well, of course, I don’t believe I have an immortal soul, no matter how god-like Cadbury seems right now! If these 23 million sell well enough I suspect there will be a second run or, maybe, even a full return to production for the chocolate bar. It will be like the summer of 1983 all over again!